This unusual looking item is called a cross-tree, dates from probably 1864-1870. It is over 5 metres long. At its widest it is the width of an old telephone pole and and its narrowest, it’s the width of an upper arm. It is covered with a fading red paint, some parts are particularly still bright red though. And there are two carved manaia at either end. One looks pretty fierce with a protruding tongue and the other is tongueless but no less impressive. 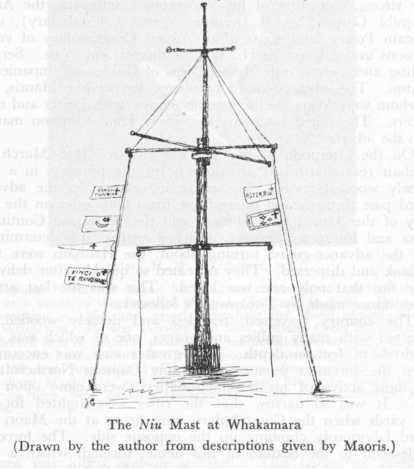 Associated with the Pai Marire faith that emerged around 1862 from Taranaki, cross-trees were components of a larger flagpole called a niu. The cross-tree name describes essentially how it was attached to the flagpole, where it was fixed horizontally approximately two-thirds or halfway up a central pole. Flags were flown from the central niu, from the cross-trees or from the ropes that bound the structure together, as you can see in the example image below. James Cowan (1956) The New Zealand Wars: A History of the Maori Campaigns and the Pioneering Period: Volume II: The Hauhau Wars, (1864–72). Wellington, NZ. p 297. Te Papa’s cross-tree was acquired from THOMAS EDWARD DONNE who had been collecting taonga Maori for many years before selling his collection to the Dominion Museum in 1905. It has never been in an exhibition before and has always caught my attention. I called this blog ‘A Cross-tree at the Cross Roads’ and pretty deliberately so. The period of the New Zealand Wars, the rise of Pai Marire (and the slightly later rise of Ringatu and Te Kooti) was a period of intense change and conflict for Maori and Pakeha. Other well-known historians have gone into this crucial nation-breaking/nation-building time for Aotearoa so I won’t go into a big essay about it here – save that for another time. But needless to say, the volcanic times of the mid 1860s created a hotbed for immense change – it was a cross-roads of sorts for this country. Also geographically, the history of this cross-tree is important. Donne collected it from Galatea which, during the period of Pai Marire, was a hub of colonial, tribal and military activity – so again, it was another crossroads. The famous soldier Gilbert Mair Jr had a base there called Fort Galatea that he used to push into the Urewera country in campaigns against the Tuhoe and Pai Marire converts. It is important to know that at the time, Pai Marire were considered dangerous rebels and there was a concerted mission to supress the rise of converts. Whenever a band of government soldiers would overtake a pa that had aligned itself with the Pai Marire, one of the first things they were reported to have done would be to cut down the niu. Interesting that this action confirms that importance that both warring parties placed on its potency as a symbol…. But back to the business…when I take visitors through the stores, I usually stop in front of this piece and ask them what they think it is. The various answers I get are “a ship’s mast”, “a crane for lifting things” and so on. And this isn’t so far fetched. The very first niu to have been erected by the main Pai Marire prophet Te Ua Haumene, had reportedly come from the mast of a ship called the Lord Worsley. So it isn’t so bad sometimes when looking at taonga for the first time to trust some of your guesses. I’ve said earlier that researching taonga can take a considerable amount of time and effort. Last week a crew of Collection Managers and one of our photographers worked hard to get images of the cross-tree, a slightly awkward task given the size and shape of the cross-tree. It was too large to comfortably take down to the photography studio so it was arranged that it would be photographed in the collection store. I also had one of the Conservators to assist in checking it over, and to examine the paint and wood. The paint or pigment on the cross-tree appeared pretty unstable. While we handled it with rubber gloves, the pigment still left a residue on our hands, even with very careful handling. It has a very powdery quality – kind of like the old powdered tempera paint that primary school kids from the 70s and 80s would have used. Because of this I had suspected it was kokowai rather than European paint that had been used to colour the cross-tree (kokowai is a fascinating story all on its own but click here if you want to know more about it). And while Maori in the 1860s had access to european paint, the contemporary writings from the 19th century also describe niu as being painted with the traditional kokowai rather than european lead-based paints. 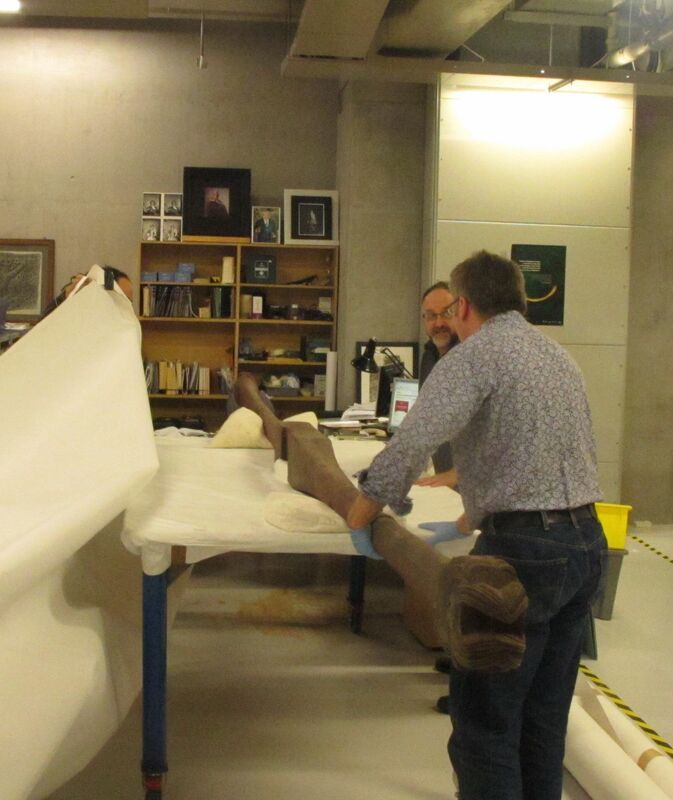 I’ve written the official description and that’s now available on Te Papa’s Collections Online here, along with more images of the cross-tree. I have been researching it for the last four months and hope to have a more detailed paper and presentations readied for the public within a few months time. While there is very little knowledge about this actual cross-tree, the more research I uncover about it the more intriguing and hugely significant the stories attached to it become. That is the marvellous thing about working closely with taonga; you never know what it will tell you until the timing is right. We have a cross-tree on our flag pole at the Whareroa Marae Mt Maunganui.